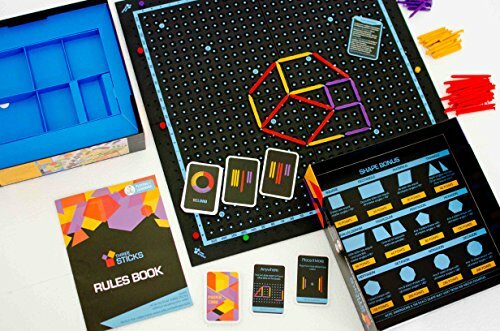 Encourage math skills with this engaging, competitive game based on geometry! Great for all ages. Anyone who remembers playing Dots as a kid will likely look fondly on Three Sticks. Going far beyond just making squares and claiming territory with an initial, Three Sticks makes geometry creative, strategic, and competitive. Players take turns placing sticks on a gridded board, creating geometric shapes as they go. The player who connects the sticks to complete a shape gets the points, and the first player to reach 500 points wins. Simple enough to get started, and with some creative spatial thinking, the game becomes more about strategy than about shapes. Getting great reviews, Three Sticks can be played by just about all ages, and helps reinforce a multitude of math concepts. An understanding of perimeter, area, and angles can all be improved over time just by noticing the patterns of shapes during play. Even the scoring system adds an interesting spin to otherwise basic addition. If the instructions seem a little confusing, check out this full tutorial. There's also a shorter video for a more to-the-point version. Four plastic boards fit together to make a gridded gameboard. Three sizes of plastic sticks snap into the grid, while players can keep their score using the pegs along the board’s perimeter. Recommended for ages 8 and up, but younger kids could join if they have a decent grasp of shapes and how to make them. We break down some of the rules in this section, but for an in-depth explanation on how to play, check out this video, made by the creators. It goes over the whole rulebook in less than ten minutes! Players take turns placing sticks on the board to create geometric shapes. When a player completes a shape, they gain points. Points are awarded based on the completed shape’s perimeter, shape type, and any blue bonus circles that may have been encapsulated by the shape. Note: Blue bonus circles can ONLY be scored by the person who first completes the shape around it. So if Player A makes a rectangle with a blue bonus circle inside, and Player B uses their turn to make that rectangle into two triangles, Player A is the only one who gets the claim those bonus points. Players keep tab of their score using three plastic score markers on their side of the board. These three pieces are moved to indicate hundreds, tens, and ones, giving just another mathematical component to the game. Power Cards: These cards give players opportunities to use special moves during the game. During set-up, give each player five Power Cards. These cards are kept hidden from other players, but will be turned face-up once a player has put them into use. Each card can be used once, with a maximum of two cards played during any single turn. These cards are NOT refreshed throughout the game. However, when we admitted a very young player to the group, we each randomly drew one of our Power Cards to give to them, just to help level the playing field. Reload Cards: Each player gets one at the beginning of the game. This card shows the combination of sticks that player will receive once they run out. The Reload Card does not change through the game, and sticks can only be reloaded once all sticks have been played. When multiple shapes are created in one turn, the player must choose which shape they want to gain points for. It’s hard to come across a math game that gets kids excited to play, so we were really excited to find this one. 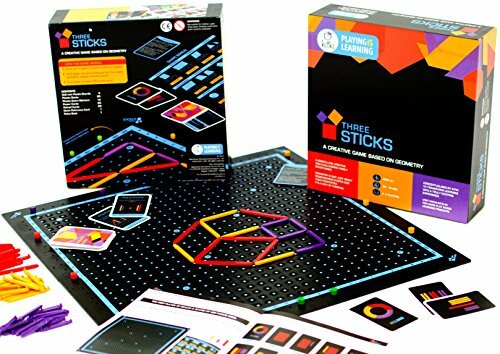 Three Sticks is a simple enough premise that beginners can have a blast, while more advanced players can enjoy the various strategies that can take place. Some players like to play straight-forward, making shapes as they become available, while other players work to cut off their opponents shapes while the shape is still small, thus decreasing the total points gained by other players. Either way, this game can be quick and easy, or highly competitive. We didn’t find much trouble in having players of varied skill levels playing together. Like we said about the Power Cards, we sometimes decided to give more cards to the underdog to help them out, but this didn’t change the overall flow of the game. We did impose a time limit for the older players since we tended to take our sweet time in figuring out how best to block an opponent’s future moves, and the little kiddo just couldn’t wait that long for each turn to come back around. As for the pieces, they are thin, small, plastic sticks, so they do count as a choking hazard. A number of users have said that they sticks sometimes pop out of the board during the first few games, but over time the board will loosen up a bit, making the sticks fit in better. The board itself fits together fairly loosely, so hitting the board with an elbow or letting part of it slide off the table may result in it detaching, scattering pieces everywhere. A small jostle here and there shouldn’t be a problem, though. 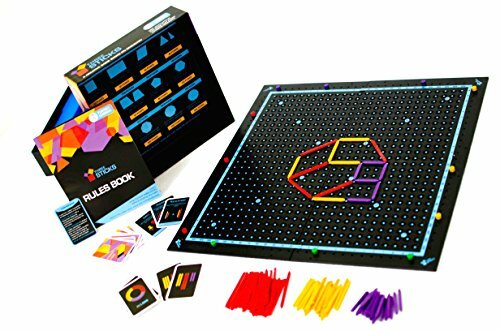 Overall, a great game for those with good visual-spatial skills, a mind for shapes, or those who enjoy counting points to determine how best to block everyone else. For more information on how to keep toys clean, check out our Cleaning Guide for Toys. The game comes with areas in the box to hold all the pieces, so there’s not really a need for a bunch of plastic bags unless the box is not being stored upright. The small pieces may be a choking hazard for small children.